Portsmouth University bioreceptive design tutorial and workshop. Last week our director Nige and artist Hannah George were asked to deliver a workshop and tutorial relating to the work of Artecology. They worked with forty Interior Design students at Portsmouth University’s Creative Cultural Institute to first, learn about the principles behind Artecology, and then experience some of the prototyping and making techniques we use in our own studio in Sandown Bay. First up Nige gave an illustrated lecture on why the world needs Artecology and then rounded up with a discussion about some of our making techniques and materials we use. This was followed by an hour long tutorial and making session with Hannah as she guided students to make paper moulds to use in the process of prototyping textured concrete tiles. 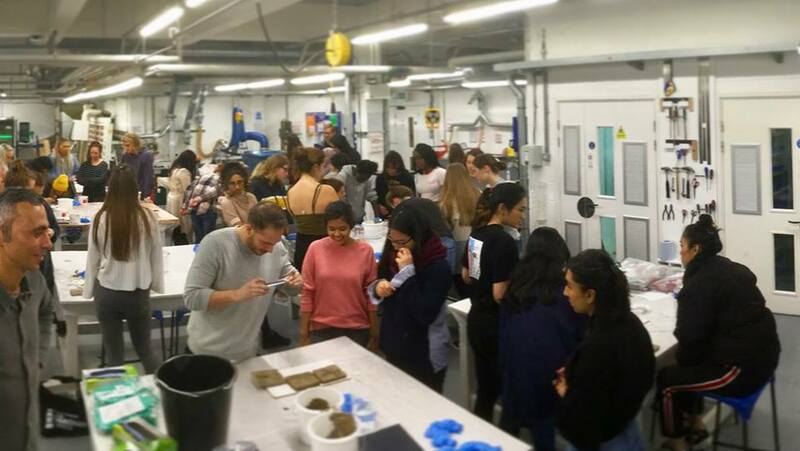 Finally all forty students assembled in the University’s own maker-space where they spent another hour mixing ‘Natural Concrete’ and pouring it into the paper moulds they made with Hannah. The unusually fast set time of ‘Natural Cement’ meant that students were able to demould their concrete tiles within fifteen minutes of pouring them, much to the surprise and delight of everyone involved! The students had never worked with concrete before and despite this they produced some superb pattern imprinted tiles. Many students seemed eager to start the process of mould making and concrete pouring again at the nearest opportunity. It will be fantastic to see what they produce when they have had a chance to experiment in their own time.